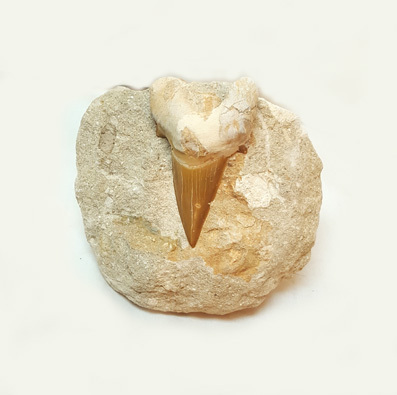 These fossilized sharks tooth is relatively young as fossils go, only about 50 million years old. This relative of the modern sand shark continuously replaced teeth that were shed or lost during feeding. These fossils are found in the Atlas Mountains of Morocco. The size of the tooth is approx. 1.5" on a sandstone matrix that measure up to 3" - 4" across. These attractive serving dishes are sculpted from Orthoceras and Ammonite fossils in matrix that have been polished smooth and then are accented with an Ammonite fossil on the handle. Dishes measure 8" x 6" approximately. 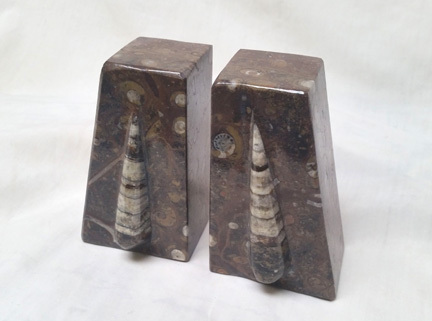 Orthoceras Fossil Bookends have an Orthoceras Fossil on the face of each pair. These will make an attractive addition to an office, study, or library. They could also be a fine centerpiece for any book table. The new Fossil Dinner Plate is sure to be a conversation starter! Each 12" x 12" square plate is sculpted from Orthoceras and Ammonite fossils in matrix that have been polished smooth. These pendants feature the fossilized tooth of the Enchodus, a large predatory fish from the Cretaceous period (66-96 million years ago). Given its streamlined body and large sharp teeth, Enchodus was most likely a ferocious fish that struck its prey with lightning-quick attacks. The teeth are approximately 1.5" - 2" long and is sold at $1.00 each in a pack of 10. This Petrified Wood is from the Rainbow Beds in Navajo County, Arizona. These slabs are cut from large pieces of Petrified Wood and polished on one side to show the beautifully intricate patterns in the wood. 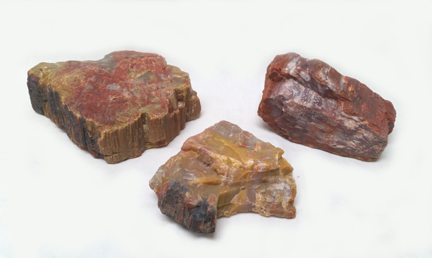 Our Petrified Wood Slabs are priced by weight at $14.00 per pound and are available in 8 price ranges. Sold by each. NEW SIZE!!! 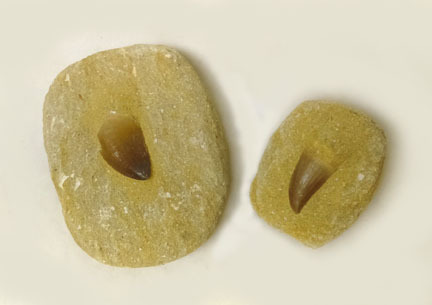 These fossilized teeth belong to the undisputed Emperors of the high Cretaceous Seas. The Mososauridae were a family of enormous serpentine marine reptile. Growing up to 60 feet in length, having stocky powerful teeth and double hinged jaws like a snake, enabling it to swallow it's prey whole. Mososauridae was the scourge of all ocean dwelling creatures. These fossils are found in the Phosphate deposits of Northwestern Morocco. 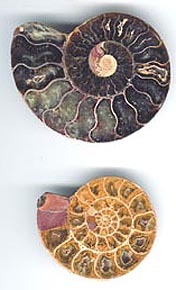 SMTM/S - $5.00: approx 2" - 3"
SMTM/L - $8.00: approx 4.5" - 5"
Ammonites are the ancient ancestor to the modern day Nautilus. A Marine Cephalopod approx. 350 million years old. These fossils are found in the Atlas Mountains of Morocco. The fossil is polished but the brown matrix is rough. Because of limited quantities of each price point we are consolidating them into 2 groups. All fossils come with an information card for each fossil. These Semi-Polished freestanding sculptures stand between 6" to 12" high. They come in various shapes and sizes. They make a great knick-knack for desk or end table. 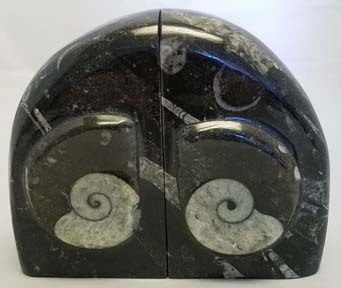 Ammonite Fossil Bookends have an Ammonite on the face of each pair. These will make an attractive addition to an office, study, or library. They could also be a fine centerpiece for any book table. Black bookends with Rounded edges measuring approximately 5.5" wide by 4.5" tall. This new addition to our Fossil Plate selection is a new variation of our Circular Fossil Dinner Plates. They are sure to be a conversation starter! 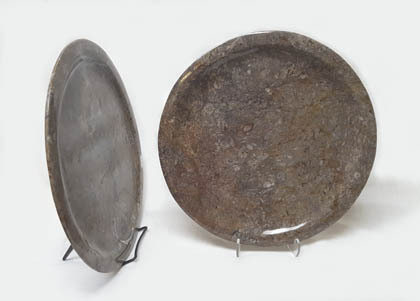 These Large (approximately 11.5") plates are priced at $30.00. They are sculpted from Orthoceras and Ammonite fossils in matrix that have been polished smooth. They are .5" smaller across and are slightly thicker than the FDP/R with a raised lip on the outside of the plate. Very limited supply, so order while they last!!! 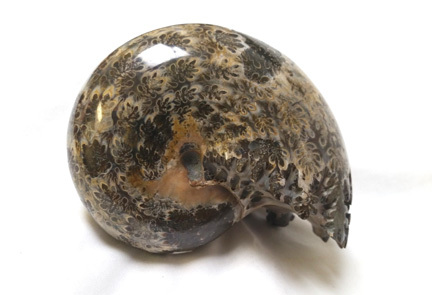 These beautifully polished Ammonites from Madagascar are meticulously engraved to accentuate each and every nuance in the shell. These pieces are a wonderful conversation starter for anyone's home or office! X-Small - SWPA/XS: $10 - $19; from approx. 2.5"L x 1.75"W x .5"
Small - SWPA/S: $20 - $35; from approx. 3"L x 2"W x 1"
Medium - SWPA/M: $36 - $50; from approx. 3.25"L x 2.5"W x 1.5"
Large - SWPA/L: $51 - $70; from approx. 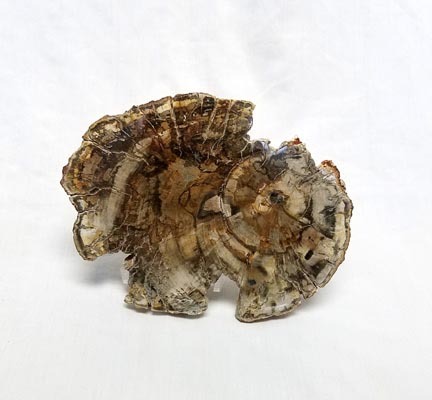 3.5"L x 3"W x 1.75"
Being a product of nature, size and shape WILL vary. Sold by each. NEW SIZE & PRICING!! This 350 million year old extinct cephalopod is a distant relative to the chambered nautilus. They occurred in many diverse species all over the world. These Ammonites are from Madagascar. Approximately 1.5" - 2" across.